खेल कूद की जानकारी /Game jump information - सभी जानकारी हिंदी में ! The national game of Canada is ice hockey. United States is the national sport baseball. Hockey is India's national game. The national sport of Scotland is ice hockey. America's national sport is baseball. Turkey started the game of polo in India. Polo game in India started from Manipur state. Kabaddi game started from India . Chess started from India . Cricket game started from England. "SuperMax cricket" has started from Australia. The number of players in the water polo is 4. 9 players in baseball live. The number of players in Volleyball is 6. The number of players in basketball is 5. Winter hockey game- Number of players in 'ice hockey' is 6. The number of Basketball players is 5. 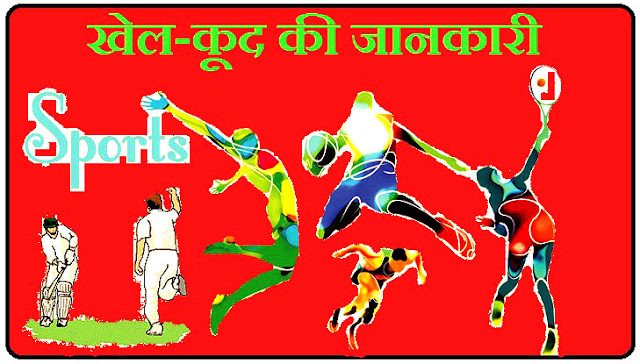 The number of players in kabaddi game is 7. The time of international football competition is 90 minutes. The international hockey tournament time is 70 minutes. Boxing competition consists of three rounds of 3-3 minutes. The magician of hockey is 'Major Dhyanchand'. Major Dhyanchand is known as Dada. Nasquiman and Edson Antilles de Nassimetta are famous in the world of football after the name of the Black Pearl. Shoaib Akhtar is known in the cricket world as "Rawalpindi Express".
'' David Shepherd '' is known as the Dancing Umpire. Sachin Tendulkar is known as "Bombay Bomber". Sunil Gavaskar is known as "Little Master". Spin bowler Anil Kumble is known as "Jumbo". Harbhajan Singh is known as "''Turbineator ''. Sagrei Bubka is called "the King of Polavalt". Kapil Dev's full name is Kapil Dev Ramlal Nikhang. Birth occurred in Chandigarh (Haryana) on 6 January 1959. Jhulan Goswami's full name - Jhulan Nishit Goswami. Birth occurred in Chakda (West Bengal) on November 25, 1983. Mitali Raj's full name - Mitali Dowraj Raj. Birth occurred in Jodhpur (Rajasthan) on 03 December 1982. Rahul Dravid's full name - Rahul is Sharad Dravid. Birth occurred in Indore (Madhya Pradesh) on 11 January 1973. Sunil Gavaskar's full name - Sunil Manohar Gavaskar Born July 10, 1949 in Mumbai (Maharashtra). The full name of Sourav Ganguly - Sourav Chandidas Ganguly. He was born on July 08, 1972 in Kolkata (West Bengal).